The Amish Pinnacle Royal Mission Double Pedestal Table is a beautiful addition to any dining room or kitchen dining space. The Pinnacle Royal Mission has expertly crafted pedestal bases boasting the defined lines and angles of mission style designs with a strong stretcher and pedestal feet creating an optimal support system sure to provide strength through dinners and activities for generations. 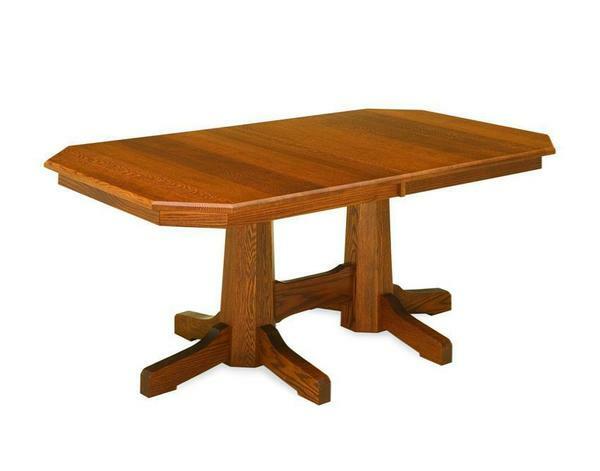 Contact us today to speak with a friendly and experienced furniture specialist who will be happy to assist in creating the perfect dining room table for you and your home. Stores up to 4 leaves in any size, (2) w/skirt, (2) without - except 42x60 only stores 2 leaves.